Who I was twenty years ago. | Damian Trasler's Secret Blog - Do Not Read! ← 2011: The year of the return visit. Who I was twenty years ago. Never got the hang of juggling ON a unicycle, but I'm one of very few people who juggled WITH a unicycle. I was surprised and shocked yesterday morning: picking a t-shirt out of my drawer, I noticed it was from a juggling convention I once attended. In 1991. I was shocked because I realized that’s twenty years ago. You may find it shocking that I have a twenty year old t-shirt, but what got to me was the thought of how long ago that section of my life was. I got into juggling as the result of some unlikely coincidences. I was watching a TV show (The Paul Daniels Magic Show, I think) and there was a guest star on it, who was dressed in a green felt suit and juggling Snooker balls. He’d catch these balls in special pockets he had sewn to his shoulders and hips. I was impressed, and determined to learn to juggle. (I was around thirteen or fourteen, still at an age where these impulsive decisions can be made. Now I would sit back, shake my head and imagine how many times the juggler had injured himself to perfect his act.) One of the unlikely coincidences I mentioned was us having a snooker table in the room where I was watching television. Another was that I picked up some of the snooker balls and figured out the basics of three ball juggling in an evening WITHOUT BREAKING ANY HOUSEHOLD ORNAMENTS. I had to wait a couple of years for the next coincidence. My college were putting on a big show for the end of the term, and they needed everyone in it to juggle for a big street scene. To achieve this, they asked an ex-student who was now a street performer to come and give lessons. When he discovered I could already juggle three balls, he leant me a set of juggling clubs, and, worse, the catalogue of a juggling supplies shop. By the end of that year I was running a juggling course at the college, and by the end of the next I was running an Adult Education course in juggling. 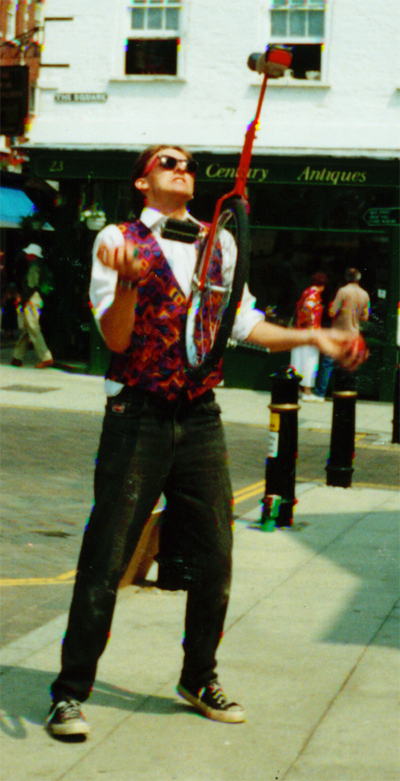 For around ten years, juggling was a big part of my personal identity. I tried quite hard to make it my profession, forming a troupe called “The Juggling Fiends” and performing at parties, festivals, running workshops. 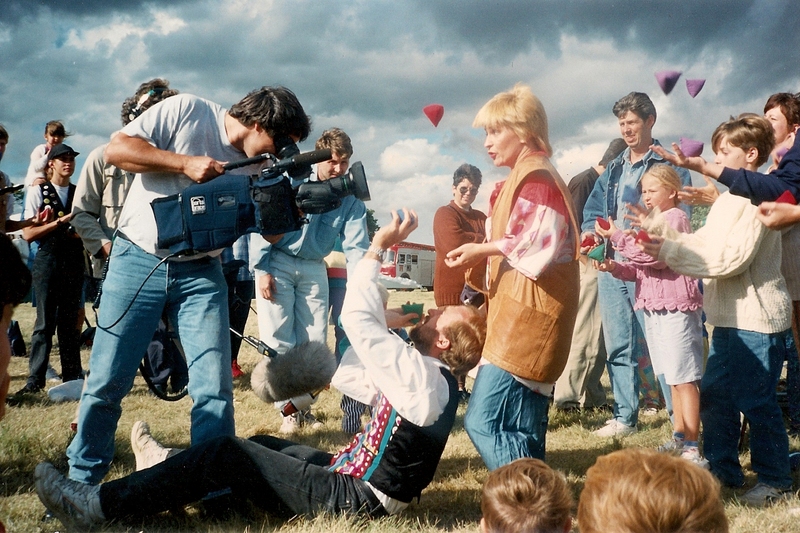 We even had a spot on a tv programme. But it’s hard to make a living from juggling, harder than it is to make a living from writing. The troupe drifted apart as life intervened, and though we all stay in touch, we’ve never had a full Fiends reunion. We all still juggle though, it’s not a habit you have to kick when you grow up. I brought a trunk full of juggling stuff over to Canada with me, and the clubs will come out over the summer. The Weasels like playing with the stuff, but none of them have been bitten by it the same way I was. But looking at that t-shirt yesterday made me see how our view of ourselves can change over time. For about ten years I was a juggler who had to do other jobs to earn a living. For the last decade I’ve been a writer who sometimes takes a day job while minding the weasels. For a glorious year here, I was just a Playwright, before the falling exchange rate sent me off to The World’s Largest Home Improvement Retailer. Maybe the next ten years will bring another change. This entry was posted in Uncategorized and tagged Damian Trasler, identity, Juggling, Juggling Fiends, Play writing, playwright, Toyah Wilcox, writer, writing. Bookmark the permalink. Those were great times, juggling, buying juggling kit from Pippa Tee and almost setting fire to a number of village halls in the name of local entertainment (don’t catch the yellow end was the fire-club novice’s Health and safety mantra!! ). 20 years later and I’m not a master juggler, but it’s still a thing that people remember well. I once threw a few juggling balls around for my aged grand-parents. They still talk about it – it’s still cool to be a juggling fiend. Perhaps in this age of austerity, these home-spun skills will once again take centre stage (…more puns please vicar!!). As a 2011 dad, Juggling could be a winner for home entertainment again and perhaps a welcome distraction and source of amusement this summer. Nothing takes me back to those days like a whiff of paraffin! I hadn’t considered the fact that we would be Juggling Fiends for life. I’d have made the badges more durable for one thing…. OK, that has to be it: Best. Picture. Ever!